Nothing is more important to the Brain Tree than his continuous accumulation of knowledge. There's a spark of satisfaction each time he adds a new entry, and he feels a sense of fulfillment knowing he's responsible for an archive of records that will be forever useful to all Neopians for many ages to come. In addition, the quests he hands out whenever he cannot find the answer in his own vast library also serve to give Neopets a sense of accomplishment at having contributed to the Brain Tree's never-ending quest for knowledge. That's the generous description, anyway. The more truthful version is that he finds it amusing to watch Neopets scuttling around eager to do his bidding, frequently spending tens of thousands of Neopoints in an effort to obtain the information required. Not to mention their reaction when they get nothing but a handful of coins and an almost worthless item is his highlight of the day. He's a tree. He'll take his amusement wherever he can. He does have his occasional moments of magnanimity when he'll reward more Neopoints than usual. It is, however, debatable whether the gesture is completely selfless, since occasional tales of his great rewards are curiously correlated with the number of excited Neopets visiting him afterwards. Once, a rather brave Gelert (according to the Gelert in question, anyway; others said he was stupidly reckless) had asked why the Brain Tree didn't just feed the Esophagor himself since he was so conveniently rooted just north of the creature. The Brain Tree had widened his eyes menacingly and the Gelert had looked terrified, whimpered an apology, and dashed away as fast as he could. In effect this means the Brain Tree manages to save his Neopoints, obtain the knowledge he desperately craves, and satisfy his sadistic streak in watching Neopets empty out their bank accounts to serve him. All in all, he's rather content with the quality and consistency of his day to day life. Jay the Lupe is in the middle of doing what he does best - namely, absolutely nothing - when she appears in a bright multi-colored flash of light. He blinks. He is not accustomed to seeing beautiful faeries materialize out of nothing. The faerie smiles, and Jay stops blinking. He is kind of scared that if he closes his eyes for even a millisecond, the faerie might disappear. His Pawkeet, Chaos, is more coherent. "You're the Fountain Faerie!" Chaos is very talented at stating the obvious. The Fountain Faerie somehow looks even more beautiful as she makes her request. Both Jay and Chaos look slightly dazed when she vanishes again in a puff of rainbow smoke. Six hours later, Jay is groaning amidst the maze of stalls in the Island Trading Post. The cheapest Famous Chias he can find has an asking price of 600,000NP, which is probably more than the combined value of everything he has ever owned in his life. "Just refuse the quest already," grumbles Chaos, whose feathers look rather the worse for wear after weaving through endless stalls. Jay considers pointing out that Chaos really has no room to complain. There are probably hundreds of petpetpets currently nestling in the layers of mud and grime covering his paws, which is a situation that Chaos, being blessed with wings, does not have to deal with. He decides, however, to direct his efforts in a different direction. He explains to Chaos that when the Fountain Faerie asks you to jump, you do not waste time asking how high. You kind of do your best to read her mind and then do it. Luckily, the Fountain Faerie is an extremely generous and benevolent being who is specific in her requests, which means they are spared the entire mind-reading process and can get to it immediately. Chaos stares at him rather blankly. "Was there supposed to be a point in there somewhere?" "We're getting that book." Jay pauses. "Somehow." "Well, why couldn't you have just said that to start with? And I don't see why you even want to complete it anyway since you've never expressed a desire to be a different color." Jay explains that it's the principle of the thing, thereby explaining nothing. "And also, I have a plan." Chaos groans. He has had entirely too much experience with Jay's plans. Jay ignores him. He is awesome at making plans. "It's Halloween, Chaos. How do you feel about a trip into the Haunted Woods?" Halloween always puts the Brain Tree in a better mood than usual, as more and more Neopets flock to the Haunted Woods in celebration. This year is no exception, and he gives out quest after quest to the never ending parade. It's late afternoon and there's somewhat of a lull in the rush of Neopets when a lone Blue Lupe sidles up. He booms his usual greeting and asks if the Lupe wants to accept his quest. The Lupe looks decidedly nervous as he accepts, glancing nervously around every few seconds. He waits impatiently for the Lupe to be on his way, but to his surprise the Lupe comes closer, a somewhat shaky smile on his face in an attempt to appear genial. "So I'm Jay! I'm not sure what to call you." "Brain Tree," says the Brain Tree, by which he really means 'For the love of Sloth why are you still here?' He's just that good at conveying meanings through tone of voice. The Lupe either really doesn't understand or decides to purposefully ignore the Brain Tree's true meaning. He ventures even closer. "I've heard that you have a really big library where you keep all your records and books for research. Is that true?" The Brain Tree really does not have many ways of forcing others to do what he wants, seeing as he is a tree. He mostly relies on a booming voice and threatening glares, which has generally worked well for him up until now. His branches wave around agitatedly as he growls, "That's right." "That's wonderful!" beams the Lupe, and all traces of nervousness have vanished. "Do you keep a catalog? How do you remember what you have? And what is where? Oh, and I've heard of this really rare book called Famous Chias– do you have that one? How long has it taken to get all those rare books?" The Brain Tree groans inwardly. He can see several groups of Neopets making their way over, and he really wants to assign a few more quests and hopefully obtain more data this hour. As rapidly as he can, he answers the Lupe with as few words as possible. It might be his curtness, or his increasingly obvious impatience, or the fact that his stare is reaching boring-holes-in-your-soul proportions. He really doesn't care which does the trick as the Lupe dashes away hurriedly, hint taken and his nervousness clearly back. The Brain Tree’s annoyance only increases during the next ten minutes when his rather impressive commands to various Neopets ("KNEEL BEFORE TREE" and "MORTAL I NEED YOUR HELP") are made to sound considerably less impressive by the constant squawking of something nearby. His sap is just about to reach boiling point when he catches sight of a Pawkeet flying away, squawking in triumph with something green and yellow clutched in its talons. He hopes that whatever prey it caught lasts a very long time before it needs to returns to anywhere near the Brain Tree. A few hours later while trying to look up the death details of Derek the Chia, he realizes that what the Pawkeet had actually held was a book. And that he is coincidentally missing the very book that Jay the Lupe had mentioned. The Brain Tree thrashes his branches wildly, glares at everything and everyone around him, and screams curses at the pair of thieves. The Brain Tree is an excellent multi-tasker. He is still fuming when a rather large group of Neopets appears in his peripheral vision. They all look rather young, rather nervous, and rather giggly. As they draw near, he overhears some of their conversation. "You should be the one, Sandy. It was your idea to try your luck at getting a good reward." "That's not fair! I only agreed because you all said you'd accompany me." "If only Jay was here. Where's a recklessly brave Lupe when you need one?" "Are you kidding me? That loud mouthed Pawkeet would wake up the whole place." "I bet most of the residents here are awake anyway. Halloween night is probably the highlight of the year for them." The mention of Jay, however, gives the Brain Tree pause. 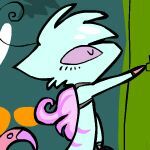 Granted there are probably thousands of Neopets called Jay, but the added mention of 'recklessly brave Lupe' and 'that loud mouthed Pawkeet' considerably raises the probability that the group is referring to the very pair that dashed away mere hours ago. Which gives him an idea. He waits as the group inches closer, and watches with amusement as each Neopet tries to simultaneously move forward and still remain behind everyone else. In the end, a Blue Grundo with disconcertingly large eyes is left at the front. The Grundo looks up at him. The Grundo quickly decides that a staring contest is not the way to go and lowers his head. Ordinarily, the Brain Tree would prolong the moment, waiting to see how long the Neopet would squirm before breaking the silence. Tonight, he forgoes the pleasure in favor of enacting his plan as quickly as possible. "I HAVE A JOB FOR YOU, WEAKLING," he booms, and the Grundo jumps. Well, he can't be expected to forgo all his usual pleasures. "I uh..." says the Grundo to the general direction of his roots. "DO YOU ACCEPT MY QUEST?" He tries very hard not to snicker as the Grundo jumps again. Snickering would ruin his menacing and threatening appearance. "Meep," squeaks the Grundo, which he takes as a yes. "As it is Halloween night, I am feeling generous and have decided to give you a somewhat special quest. I would like to know the future location of death of a certain individual." After it is apparent that the prospect of questioning him is too much for the Grundo, an Aisha from the back of the group speaks up. "The - the future location of death?" "I said it was a special quest. To make up for its difficulty, I am only asking for the location. Time of death is not necessary." After several seconds of hurried muttering, the Aisha hesitantly speaks again. "We'll accept the quest, but you haven't given us the name of the Neopet." The Brain Tree widens the hole in his trunk in a smile. Ten minutes later, the Brain Tree is waving his branches around contentedly. He had caught shocked and horrified whispers of "What if it is him?" and "We should definitely warn him if we find out!" as the group of Neopets had fled. As soon as they were out of earshot, he had commanded a Devilpuss from the neighboring spooky petpet shop to hurry over to the Esophagor with a request for a favor and a wide selection of spooky foods. The Esophagor is never one to refuse a bribe, and has always appreciated the mutually beneficial relationship between the two of them. He will know what to say when someone approaches asking for the future location of death of a certain individual. The hole in the Brain Tree's trunk widens a little more. He has a feeling that it will be a very long time before Jay the Lupe dares to set foot in the Haunted Woods again. There is only one precaution that needs to be taken to ensure maximum candy goodness: the correct costume! "Where light is, there is candy on this night!" Is this some sort of trick?